When God made you, He placed a gem inside of you-a dream with the potential to transform your life; and many more besides. Every one of us is endowed with a special gift. God did not make any empty shells. However, we live in a world where some have consigned themselves to the spectator's gallery; watching others pursue and achieve their dreams and believing that some are simply born great. Activate Your Dreams blows the lid off that theory Your key to success lies within the dreams God gave you. Do you know your dreams have the potential to make you great? Do you even know what your dreams are? 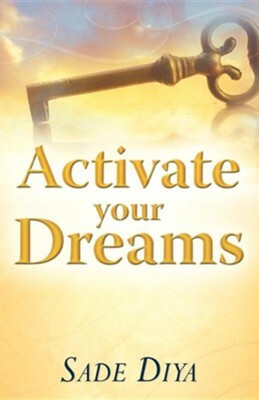 Activate Your Dreams shows you how to identify, build upon, and release your inbuilt abilities to achieve the dream life God intended for you Sade Diya is an international speaker and a sought after life and business coach. One of the new generation of young, dynamic teachers in the body of Christ, Sade challenges people to take their eyes off their setbacks and limitations and focus instead on God's big picture-His plan to reach the world through us and populate His kingdom. I'm the author/artist and I want to review Activate Your Dreams.